November 2 — All Souls Day - Commemoration - My Catholic Life! Every country has a civic feast day dedicated to soldiers who died for the nation. Every country has a tomb of the unknown soldier where an honor guard stands solemnly before an unnamed hero whose grave represents all the unknowns who never returned home. All Souls Day is like such Memorial Days and like such Tombs of the Unknown. Because of the Church’s ancient pedigree, timeless customs, and unmatched role in shaping cultures, it is more apt to say, though, that civic customs and ceremonies imitate the Church’s practice rather than the opposite. The feast of All Souls is the Catholic Memorial Day. Today the Church commemorates the souls of all the baptized who have died and yet who do not yet enjoy life with God in heaven. It is Catholic teaching that souls needing post-death purification can benefit from the prayers, alms, sacrifices, and Mass offerings of souls on earth. The Old Testament recounts the Jewish belief that the deceased benefit from temple sacrifice made on their behalf (2 Maccabees 12:42–46). Continuing this Semitic practice, prayers for the dead were offered by Christians from the very earliest years of the Church. The walls of the Christian catacombs of Rome were crowded with innumerable marble plaques in succinct Latin praying for the dead. There has never been a time when the Church has not commemorated, remembered, and prayed for the dead. Few die with their souls so perfectly purified from sin and imperfection that they proceed directly to the Beatific Vision. No one is prepared for a ten thousand amp light to shine into their eyeballs the moment they awake. Nor at the moment of death would most be prepared for the intense light of God Himself to gaze into our imperfect souls. We would simply not be prepared for such a holy searchlight to examine every dark corner of our souls. The soul needs to be purified, its sins must be burned away in the fire of God’s merciful love. This is purgatory. It is the ante-chamber of heaven, the place of waiting and preparation where the soul is readied to enter and absorb the whitest of God’s light. But souls in purgatory have no free will or ability to atone by themselves for themselves. They depend on us. They advance in purification due to our prayers and offerings for them. This is why we pray for the dead and offer Masses for their advancement to heaven. 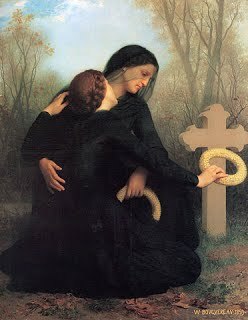 The Feast of All Souls, then, is much more than a spiritual family reunion where we visit the graves of our ancestors and recall with a tear all the good times. All Souls Day longs for a deeper bond, for an ultimate reunion with God at the head of the family in heaven with all His saints and angels. The dark arts of pagandom understand well the role the dead play in the imagination of the living. Vampires, werewolves, ghosts, zombies and witches surface in many cultures on this day. They manifest a frustrated, non-Christian longing for the afterlife. These characters are the living dead who inhabit the middle ground between earthly life and ultimate death. The undead, the forever young, the “after life but before judgment” souls lust after the flesh and blood of the living to preserve their immortality. Death feeds on the sacrifice of life, especially young and beautiful life, in this imaginary world where dark power satisfies its thirst. Today we put such fiction to the side and offer Christian prayer and sacrifice for Christian souls on a Christian feast. Through the Sacraments, grace, redemptive suffering, alms giving, good deeds and fasting we move through the shadowlands of occult fiction, horror movies, and vampire legends. The Christian does not seek eternal life as an extension or intensification of earthly life, but as a higher life in the presence of God. The hidden land of the dead is not just beyond the edge of the woods, or in the dark of night after the last light of the house is switched off. The Church offers mystery enough for everyone. The deathly battle of good and evil, of devils against angels, of sin against grace, of the cross against temptation, is not fiction. It’s as serious as cancer. In this supernatural arena, souls hang in the balance, with heaven or hell, eternal life or eternal death, resting on the scales. Today we put our fingers on that scale and tip it in favor of those we love who have gone before us. All Holy Souls, our prayers and Mass offerings are directed to you this day, in the hope that what we do on earth may benefit your advancement toward a fully divine life in heaven where you may, in turn, pray that we may one day join you there. Chapter 8 – The Glorious and Final Things!